Place the cashews in a bowl and cover with water. Let soak overnight. Drain and rinse the cashews and place in a blender along with the 1 3/4 cup water, nutritional yeast, chili powder, cayenne, smoked paprika, and sea salt. Blend until smooth. Set aside. In a frying pan and heat on medium, sauté the onions until soft. Add the tomatoes and jalapeno. Reduce heat to low and add in the cilantro. Stir and serve warm. 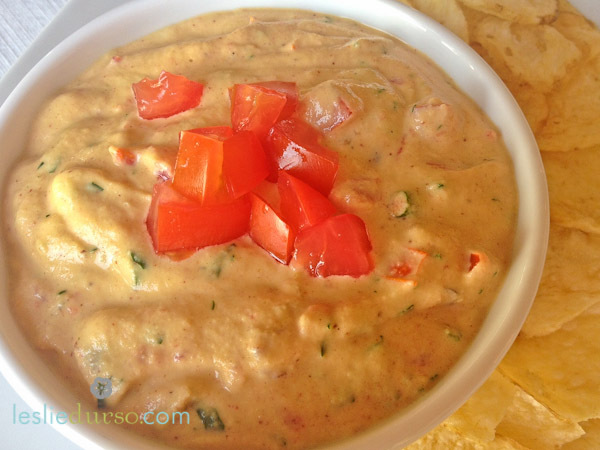 I love this addictive dip, but I make it like we do on the border, with fresh green chiles, more onion, fresh garlic, no chile powder, and more jalepenos! Jennifer, I like the sound of your version! OMG! This is the third plant-based cheeze sauce that I’ve tried and this is the ONLY one that tastes like the real deal. I could not stop eating this. I used with homemade corn tortilla chips and as a topping for a tostada. I’m looking forward to using the rest up this week. My granddaughter has a milk intolerance and misses out when the rest of the family has chips and cheese dip, so she will really appreciate this. Thank you so much for this recipe. This makes me so happy to hear!! Enjoy!